The Star People are here on Earth. Some have been born here. Some were born elsewhere and have come to live here. Some visit in space ships called Motherships, UFO’s, Cloudships, and in space vessels that appear and disappear, go fast, go slow, go up, go down in the skies – like this. There is a lot of evidence. Here we have one Australian author – Judy Carroll – who is a friend of Valerie Barrow and includes Valerie and the mission of the Mothership Rexegena in her new book, and is quoting Alcheringa many times. The path to knowledge and understanding includes the Indigenous Australians, also. 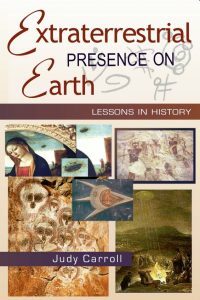 Extraterrestrial Presence on Earth – Lessons in History is the new book from Judy Carroll, detailing the ET Presence on Earth. This book principally addresses the work of star-people (sometimes called ET’s, Greys, aliens and ‘men in black’…) many of whom have been tasked to help the human evolve. The popular language is that of ascension, stargates, the higher dimensions such as the 5th and 6th Dimensions. All this is overshadowed by the chaotic nodes of misinformation, control, abuse of thought on the astral plane and manipulation of energy streams. Many higher planetary and inter-dimensional helpers are here to assist Earth and humankind’s shift from 4th to 5th world consciousness. The expansion of human mind/awareness is the key to this evolutionary process, albeit in the midst of massive interference and mis-information. 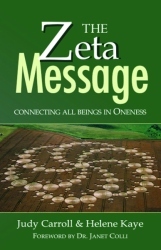 The Zeta Message is the story of contact and interaction between star people and humans. It is the story of two friends, their families, their interactions with the star people, and their learnings from the star people. It is extremely useful reading for people who work with “upstairs” or call themselves “lightworkers”; there is much to learn, and much confirmation from the stories, narratives and reflections in this book.